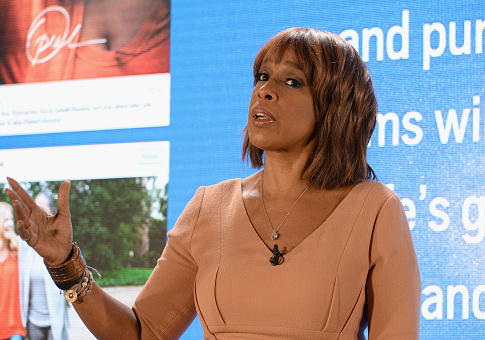 "CBS This Morning" host Gayle King said amid the #MeToo movement against sexual harassment and assault that she thinks there should be "some sort of due process" accorded to men accused of sexual misconduct. King said in an interview with New York Times Magazine that she worries when women make an accusation, "the man instantly gets the death penalty." "There has to be some sort of due process here. All of these inappropriate behaviors are not all the same," she continued. In the case of accusations against King's former co-host Charlie Rose, which led to his firing, the allegations were numerous, and some were severe. The original eight accusations against Rose detailed in the Washington Post included lewd phone calls, walking around naked in women's presence, and groping. In May, 27 additional women accused Rose of sexual harassment. NPR's Audie Cornish noted King had always considered Rose a friend, regardless of the allegations. "How have you reconciled your feelings over this?" Cornish asked. King said she didn't feel as if she'd had to reconcile her feelings. "I don’t believe in turning your back on a friend," King said, "even when a friend has done something you adamantly disagree with and you’re disappointed in." "But I also know that you listen to women, and I don’t discount their stories, either," King added. When Rose's first accusers were heard and Rose was fired in November, King said she could barely sleep and was "not OK" after reading about him. "I have held [Rose] in such high regard, and I'm really struggling, because what do you say when someone that you deeply care about has done something that is so horrible?" she asked. "How do you wrap your brain around that? I'm really grappling with that. That said, Charlie does not get a pass here … We are all rocked by this." This entry was posted in Issues and tagged CBS News, Charlie Rose. Bookmark the permalink.